For more than 180 years, the Green Mountain Inn has captivated travelers from around the world. On Main Street in the heart of historic Stowe, VT.
A great choice for your Stowe Vermont lodging the Green Mountain Inn has been welcoming travelers for more than 180 years. This historic Stowe Inn has captivated travelers from around the world. The Green Mountain Inn is located in the heart of Stowe. Completedly restored and renovated, offering the perfect blend of classic ambience and modern comfort in 104 accommodations housed in 8 separate buildings. Green Mountain Inn activities include the recently renovated year-round outdoor pool and spa, health club, game room, fire pit, and afternoon tea & cookies. The Inn is the ideal location for family vacations, weekend getaways and destination weddings. 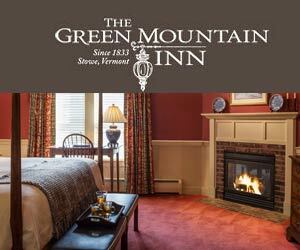 Experience warm and friendly Vermont hospitality at the Green Mountain Inn. A highly recommended historic Vermont Inn.